The more we academics believe that our heads are for creative thinking, the more we should keep them free from other “non-creative” stuff which can be safely handled by computers. Calendars are one of the oldest forms of such “distributed cognition”: keeping things out of your head. This post shares some ideas of how to make your calendars more effective. There is a very useful discussion of Mac calendars on MacPowerUsers. Although this post primarily focuses on Mac calendars it may also be useful for those who use Google, MS Outlook or other calendars. The native Mac calendar application is iCal. It is not very sophisticated although it is evolving with each new release of Mac OS. I use the application called BusyCal which is sometimes called “iCal Pro”. Indeed, it has several subtle but useful improvements to the standard iCal interface. Most significantly, it allows better control over both local and shared calendars. It is especially important if you run many different projects and need different calendars: some shared and some local. In fact, the first step of organizing your calendar is to think how many different calendars you need. Most logically, one needs separate calendars for personal and for work-related events (iCal comes with preset “Home” and “Work” calendars). My work calendars are further divided according to different areas of responsibilities: teaching, research and administration. 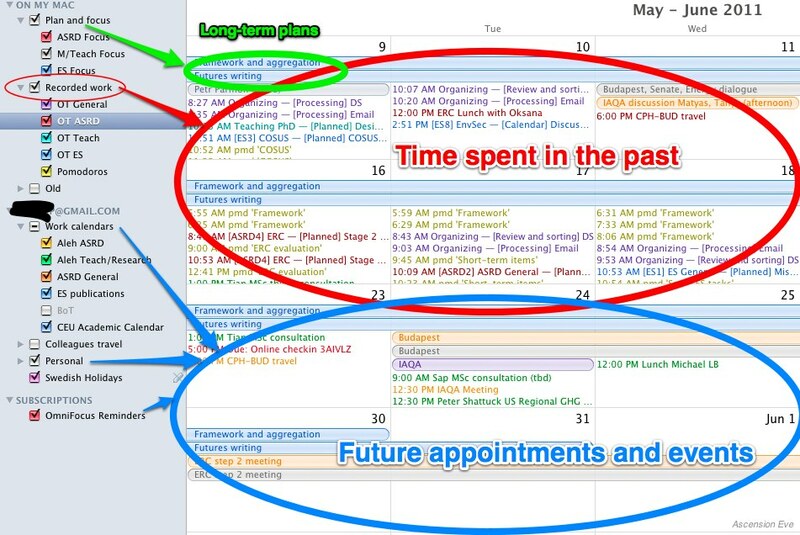 I use separate colors for these different calendars and thus can easily see where the planned (or past) time goes. The second aspect of your calendars which needs some thought is whether you want to share them with co-workers, friends or family. BusyCal offers several ways of sharing, but I find sharing through Google Calendar the most easy and natural. Google Calendar seamlessly integrates with BusyCal so that working with a calendar you do not need to think whether it is shared or not. Sharing itself, however, is handled by Google where you must specify who can see your calendars and what information is visible. To remember whether your calendar is shared (and with whom) I do not need to go to Google since I control this by calendar names and by assigning them to relevant groups. For me, sharing works very logically with dividing calendars into areas of responsibility: for example, I share my teaching, research and administrative calendars with different groups of colleagues. I also keep a separate group of other people’s calendars which are shared with me. I normally assign unobtrusive colors to such calendars as they are for my information only. iCal/BusyCal allow to “subscribe” to calendars published by various services. From the screenshot below you can see that I am subscribing for reminders from OmniFocus, my task-management system. One can also subscribe to different national holidays, historic anniversaries and other calendars – check this link. The third aspect of calendar classification that I use is a bit geeky, so it can be skipped by the beginners. I use one group of calendars for long-term planning. They are called “Focus” calendars and contain only all-day events. For example, I may decide that I work on one particular project in May and then I have a “Focus” calendar event running from May 1st to May 31st with that name. “Focus” calendars may be shared with colleagues, but they do not have reminders and are switched off (to increase focus!) unless I am in the planning mode. Another group of calendars are usual appointment and event calendars. The final group contains calendars with records of time spent. I use calendars to support my time-tracking system through synchronizing them with OfficeTime (that’s why the calendars in this group have the “OT” prefix) and with Pomodoro. I plan to describe this synchronization in more detail in another post as it is quite technical. For now, it is sufficient to note that I find it useful to keep past events and future events in separate calendars. I keep a much more detailed record of my activity in the past than I do it for the future (see the screenshot). My past activity is normally not shared with others that is why I keep it in different calendars. However, the colors I use for these “OT” calendars are similar to the colors I use for other calendars (e.g. green for teaching). During the weekly review I transfer all events on my regular calendars to the “OT” calendars (of course, only if those events have actually taken place – otherwise I might as well delete them). The final point is that BusyCal allows you to switch on or off various calendars or whole groups. You may decide to ignore all appointments, reminders past events and other work areas when you’re doing a long-term planning of a particular area. 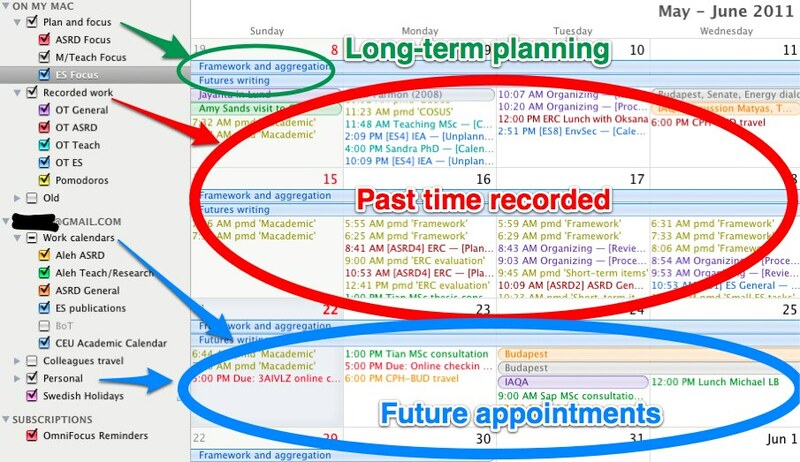 Or you may switch off long-term planning calendars to focus on upcoming appointments. The “distributed cognition” works if it can be easily disconnected from your brain and connected back in again. This entry was posted in Time and tagged BusyCal, OfficeTime, Pomodoro. Bookmark the permalink.